Nic Kent hit a 3-run home run in the bottom of the seventh inning to help the 'Hoos beat Pittsburgh 5-2. 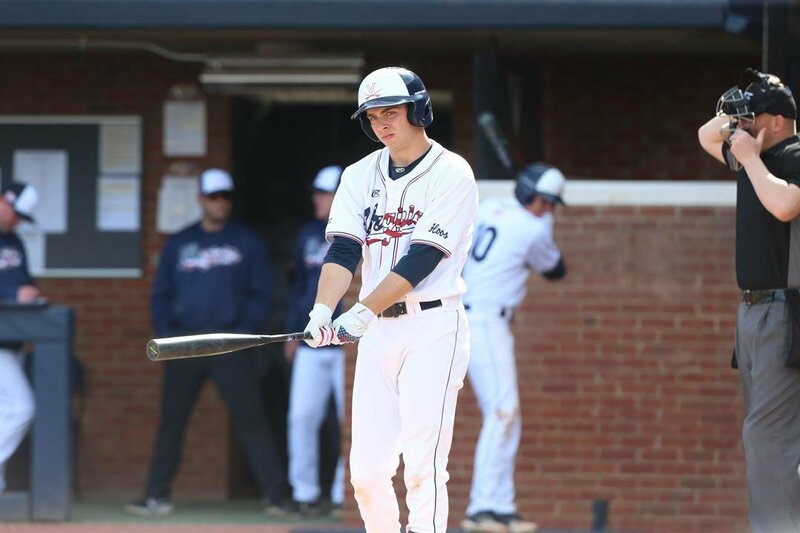 CHARLOTTESVILLE, Va. – A three-run homer in the bottom of the seventh inning by Nic Kent (Charlottesville, Va.) proved to be the difference in a 5-2 win over Pittsburgh in the series finale at Disharoon Park on Sunday (March 24). Virginia moved into a tie for first place in the ACC Coastal Division with a 5-4 record in league play, 13-10 overall. Kent drove a 3-1 pitch over the left center field wall to break a 2-2 tie. The long ball was the first of his career and locked down the first ACC series sweep for Virginia since 2017 when it took all three against the Panthers in Charlottesville. An inning earlier, fellow freshman Zack Gelof (Rehoboth Beach, Del. ), gave the Cavaliers their first lead of the game with a solo blast that cleared the bleachers in left field. The homer was also his first of his career. Gelof extended his hit streak to 12 games and has now reached base safely in all 23 games this season. Starting pitcher Mike Vasil (Wellesley, Mass.) fanned a season-high five batters in 5.1 innings pitched, his second longest outing of the season. The freshman left with the game tied at one and gave way to reliever Paul Kosanovich (Temple City, Calif.) who got the Cavaliers out of a bases loaded jam unscathed in the sixth inning, inducing an inning-ending ground out. Kosanovich stayed on to pitch a total of three innings and was credited with his team-leading fourth win of the season. After a one-out single in the top of the ninth, the Cavaliers turned to Kyle Whitten (Manassas, Va.) and the righthander recorded the final two outs of the game, including a strikeout to end it. The save was his second of the week and third of the season. Pitt jumped out to a 1-0 advantage after a solo homer by David Yanni in the second inning. Another solo homer in the seventh by Gregory Ryan Jr. off of Kosanovich, tied the game up at two. The Panthers hit six solo home runs in the series. For the second-straight day, Cayman Richardson (Mechanicsville, Va.) got the Cavalier offense on the board, with an RBI single that scoredCameron Simmons (Royersford, Pa.) in the bottom of the second inning. Richardson was the only Virginia multi-hit performer, finishing the day 2-for-2 with an RBI and a run scored. Virginia concludes its six-game home stand with a pair of non-conference games this week. The Cavaliers will host Longwood on Tuesday (March 26) and Richmond on Wednesday (March 27). Both games are scheduled for 4 p.m. starts. Virginia is unblemished at home all-time against Pitt with a record of 7-0. Brian O’Connor improved to 14-4 against the Panthers. Virginia improved to 6-7 on the year when an opponent scores first. Pitt scored first in two of the three games of the series. Virginia came from behind in all three games of the series, erasing an early one-run deficit on Sunday. The Cavaliers have faced a deficit in seven of their 13 wins this season. Simmons reached base three times going 1-for-2 with two walks and a run scored. He now has reached base safely in nine-straight games.